Put, in a piece of white paper. If at the end of 5 min. the paper is a rich yellow color, the oven is right for sponge cake; if light yellow, is too cool; if dark brown, too hot. For pound or butter cakes it should be light yellow at the end of 5 min. For gingerbreads & thin rolled cakes, it should be dark brown. 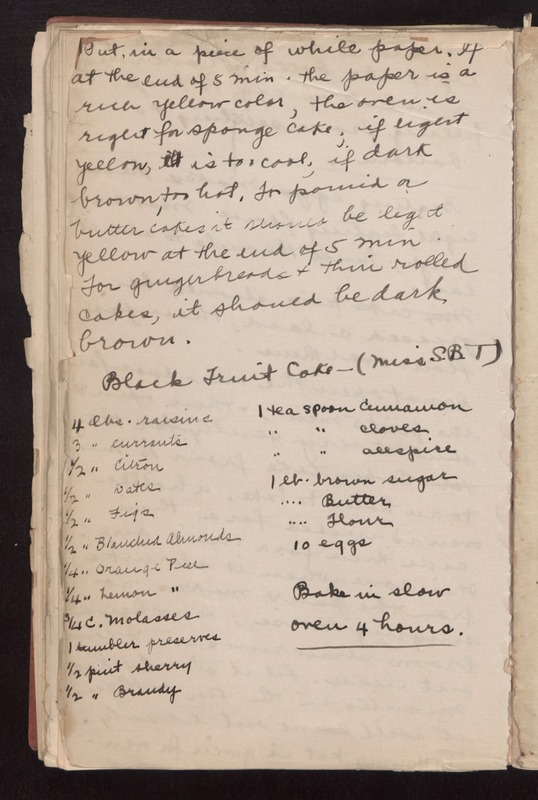 Black Fruit Cake--(Miss S.B.T) 4 lbs. raisins 3 [lbs.] currants 1/2 [lbs.]] citron 1/2 [lbs.] dates 1/2 [lbs.] Figs 1 /2 [lbs.] Blanched Almonds 1/4 [lbs.] Orange Peel 1/4 [lbs.] Lemon [peel] 3/4 C. Molasses 1 tumbler preserves 1/2 pint sherry 1/2 [pint] Brandy 1 teaspoon cinnamon [1 teaspoon] cloves [1 teaspoon] allspice 1 lb. brown sugar [1 lb.] Butter [1 lb.] Flour 10 eggs Bake in slow oven 4 hours.